A data centre is a highly complex environment. More and more businesses are realising it is essential to have someone on their team who understands all aspects of this highly diverse and technical area. Data centres are also large energy users and are therefore under growing pressure to become as energy efficient as possible. This can only be achieved by a cohesive and comprehensive approach between the business, IT & Facilities. There are many new methodologies and technologies appearing to improve energy efficiency and businesses can easily make inappropriately matched choices and spend a fortune yet still not achieve their goals. 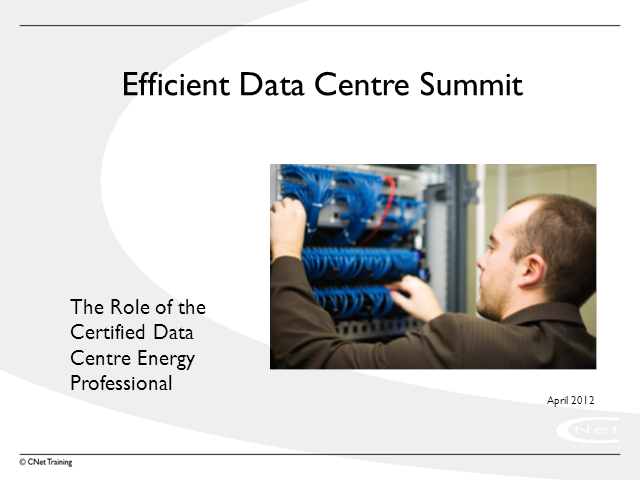 A Certified Data Centre Energy Professional (CDCEP™) is an individual who can demonstrate knowledge in the different aspects required for planning and implementing data centre energy initiatives. Through comprehensive training, a CDCEP™ has been taught what it takes to achieve an ongoing and future-ready set of strategies for the data centre, no matter what the future may bring. These individuals are uniquely positioned to create the close linkage required between the data centre and the business in order to meet the business requirement. The CDCEP™ programme has been created to provide individuals with the appropriate skills to enable them to develop into authorities in the development and implementation of long term data centre strategies to meet the business needs on a more efficient and sustainable basis. CDCEP™ is the first and still the only internationally recognised qualification in the data centre industry, recognised worldwide. In this 45-minute webinar, Patrick Flynn will make the case that the data center is the best and only place we can hope to meet the massive sustainability challenges confronting today’s enterprises and governments. Patrick will describe how data analysis holds the key to energy efficiency, business continuity and a new, better paradigm in performance measurement that will transform infrastructure and IT alike. Patrick Flynn holds an MBA from the MIT Sloan School of Management as well as a BS in Mechanical Engineering from Stanford University. His work includes identifying, prioritizing and implementing a wide array of projects within IO’s operations and product platform. He is a Professional Engineer (HVAC) and LEED Accredited Professional. Data center infrastructure management (DCIM) is rapidly ascending the CIO agenda as a way to manage data center assets over their lifecycle more efficiently. Huge cost ramifications are at play given that older equipment consumes much higher rates of power, new data centers can easily cost $100 million dollars to build, and the only constant in a data center is change. Banking – how did one of the world’s largest banks with over 1 million square feet of data center space, 25,000 racks and 120,000 servers spread across North America, Europe and Asia-Pacific reach their goal of replacing 15% of their data center assets annually? Consumer Electronics – how did one of the world’s largest consumer electronics and technology companies running nine data centers on four continents with a capacity of more than 18,000 racks and 350,000 individual servers come to replace 800 assets…per day? Retail – how did one of the world’s largest home improvement retailers operating four data centers with over 1,500 servers across a national footprint get over 500 users to participate in asset management workflow? This talk will describe the key driving forces affecting data center costs, developing and documenting detailed examples from available data, estimating costs and correcting them for inflation, and explaining the implications of the results. It also will explore some ways to improve data center efficiency, the most important and most neglected of which relate to institutional changes that can help companies reduce the total costs of computing services. In 2012, IT planners find themselves in the grips of an “Infrastruggle” – a battle for storage strategy keyed to infrastructure and technology memes and bounded by economic forces. In this session, Jon Toigo, CEO of Toigo Partners International and Chairman of the Data Management Institute identifies the drivers of the infrastruggle and offers guidelines for building a business-savvy storage strategies that will provide a foundation for meeting present and future business data management requirements. Toigo will survey six trends that threaten to increase storage cost and data risk, while reducing productivity at exactly the time when business managers are turning to IT to make fewer staff more productive. Then, he will survey effective short and longer term measures that can be taken to improve the efficiency of storage infrastructure in terms of its performance, capacity and data protection management. The availability of so many options and platforms for cloud migration seems daunting when you first start out. We started with the assumption that, at least for a smaller university, the economics of the cloud will lead to the end of life of our data center well before the end of this decade, but the benefits, costs, and opportunities for cloud migration are quite uneven and shifting rapidly. We'll share our journey and the criteria we use to decide what to move to the cloud (and where), and what to keep on premises - for now. How is cloud computing increasing the pressure on traditional enterprise data centers, (both small and large) to react rapidly to the changing needs of the business and their customers? What new tools and working practices are emerging to enable technology professionals to create and deliver high quality services more quickly? In this session, we’ll look at ways you can distill cloud computing down to principles that you can apply to how you manage your data center and deliver services and build the applications that support them. We’ll look at software-based networking as a case in point, and consider how cloud principles can support your devops and agile initiatives. With funding decreasing every year for higher education, universities are turning to data centers to cut some of their operating expenses. Find out how Utah State University redesigned their data center with energy efficiency in mind to both lower the cost of running their infrastructure as well as understand their role in the environment. consumption and opportunities for improvement. This webinar will explore how these tools can go well beyond simple remediations, improving design, facilities and even IT operations as a whole. Cloud computing seems like the perfect solution for creating an efficient and eco-friendly data center -- you, personally, have no physical data center to manage or bills to pay for the facility. However, is that necessarily true? Is cloud computing a process efficient and energy efficient investment for data centers? Join this panel as industry thought leaders discuss whether you can be efficient and energy-conscious by adopting cloud computing. - How much more efficiency does the cloud provide than physical, on-premise data centers? - How are you measuring efficiency after moving to a cloud provider? - What benchmarking should you do internally before deciding what's efficient or greener? - How will the transition from traditional data center to the cloud affect how the organization runs its business? Is your storage infrastructure as energy efficient as it can be? Learn about common industry best practices and technologies such as thin provisioning, data deduplication, compression and storage-tiering to reduce energy consumption. Understand the SNIA Emerald Specification and Program for energy metrics when selecting new storage solutions. The 451 Research, a division of The 451 Group, is an independent technology-industry analyst company focused on the Business of Enterprise IT Innovation. Our research makes sense of swiftly moving trends in the industry creating information technologies (IT) used by large and midsized organizations. We have offices in the US and Europe. CNet is the world's leading provider of Data Centre training and the only source of Data Centre qualifications in the world today. Our Data Centre courses are the only means of acquiring independently awarded QUALIFICATIONS that are accredited by the largest number of independent organisations of any communications training provider; these include City & Guilds, BTEC (Edexcel), and BICSI. CNet also provides specialist training in IP & Communications with a full portfolio of technically based courses. The Data Centre Alliance is a professional, not-for-profit association open to all Data Centre operators and Data Centre industry organisations to represent the data centre industry to the business world, academia, the media, governments and the general public. This presentation shall explain the implementation of fresh air direct evaporative cooling systems in larger data centres. These systems can reduce conventional cooling costs and energy use by over 90% and can enable data centres to achieve a PUE of 1.1 or under. Design examples shall include retro-fit and new installations up to 5MW. The experience gained by installing the EcoCooling Computer Room Evaporative Coolers (CRECs) in over 90 data centres and server rooms in the UK shall be shared to help viewers understand in detail the factors to be taken into consideration when considering this technology. Without changing the way you manage the data centre, you won’t get the benefit of DCIM toolsets. So which comes first? tools, process changes or the people changes? This talk covers the issues that affect the efficient running of data centres beyond DCIM toolsets. - To raise awareness among managers, owners, investors, with targeted information and material on the opportunity to improve efficiency. - To provide an open process and forum for discussion representing European stakeholder requirements. - To develop a set of easily understood metrics to measure the current efficiencies and improvement. - To produce a common set of principles in harmonisation with other international initiatives. - To support procurement, by providing criteria for equipment (based on the Energy Star Programme specifications, when available, and other Codes of Conducts), and best practice recommendation for complex systems. Can Utility Funding Drive Data Center Energy Efficiency Programs? What is the best way to align Owner/Operator Efforts with these Programs? The Green Data Center Alliance is working with NYSERDA and It’s End User Membership to address these questions and implement a program that hopes to marry the mutual goal of both industries – Energy Reduction in Data Centers. Chris Stump, Project Manager with NYSERDA will cover existing programs relevant to the data center, funds available, and how the GDCA effort fits within their overall program. Derek Schwartz, Executive Director from GDCA will discuss the mission of the group, its roots and why the NYSERDA program is important for the industry. Daniel Skutelsky, Director Certification & Compliance from GDCA will discuss the creation of the framework, status update on progress, describe the Pilot program and provide feedback from participants and how the program is evolving. The data center is ruled by two masters. Facilities control power, cooling, building systems and construction. IT is responsible for the equipment, software, process and service delivery to business units. The line between these two organizations has always been blurred and in these gray areas, cracks quickly become fissures when the data center is reconfigured, expanded, or relocated. The Green Data Center Alliance strives to be the central repository of information for myriad industries that design, build, operate and support data centers who wish to contain, control, and reduce power consumption inside the data center envelope.